Surrounded by the Magaliesberg Mountains, and exquisite gardens, Budmarsh is the ideal wedding venue for a small, intimate wedding in Gauteng. At Budmarsh you are guaranteed friendly staff, and attention to every detail. We can cater for up to 40 guests. BudmarshCountry Lodge is set in the beautiful Hekpoort valley of the Magaliesburg. Nestled in the tranquil surroundings of the Magaliesburg Mountains, Budmarsh Country Lodge epitomises understated elegance. 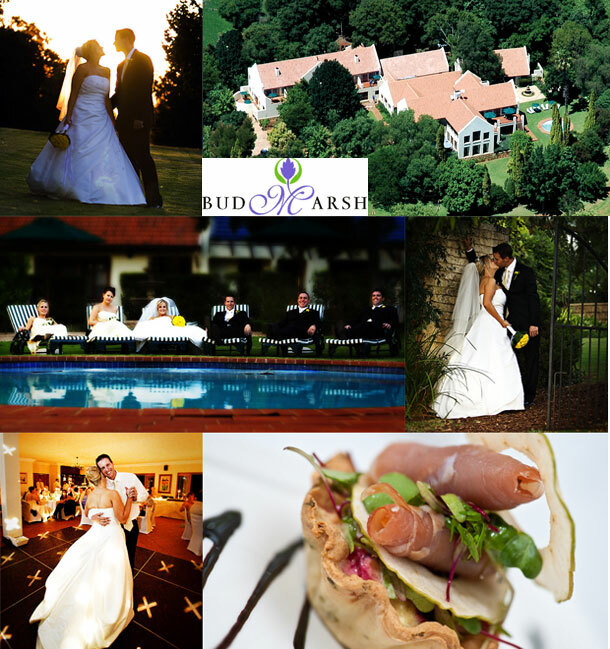 Surrounded by majestic trees and exquisite gardens, Budmarsh is a bird lover’s paradise, and an ideal wedding venue. Exchange vows in our landscaped rose garden and then enjoy your reception in our banquet room. Budmarsh is ideal for smaller intimate weddings. At Budmarsh you are guaranteed experienced and friendly staff, and attention to every detail. Whatever your dreams, Budmarsh will enthrall you with its homely elegance and exceptional care. If you would like to hold your wedding at Budmarsh Private Lodge see additional information at Budmarsh Private Lodge.